Taj Mahal, one of the seven modern wonders of the world, is synonymous with India, especially in foreign countries - I remember a few years ago watching the scene in Armageddon where Indians are gathered outside Taj Mahal and offering prays as the world is about to be destroyed. I wondered, back then, if the director is ignorant or simply unaware. Looking back at my reaction then, I realize it was I, who was ignorant. Taj Mahal is what many in the world visualize when the think of India. This sublime structure erected on wishes of Shah Jehan, in commemoration of his beloved wife Mumtaj Mahal is the greatest and most awe inspiring monuments of love. Build entirely of marble, Taj Mahal was famously referred to as 'a teardrop on the cheek of time' by the Nobel laureate Rabindranath Tagore. The rigor of a perfect elevation of astonishing graphic purity is disguised and almost contradicted by the scintillation of a fairy-like decor where the white marble, the main building material, brings out and scintillates the floral arabesques, the decorative bands, and the calligraphic inscriptions which are incrusted in polychromatic pietra dura in the construction of Taj Mahal. It definitely rates high among top destinations in world to visit before you die. Built by Mughal Emperor Shah Jahan to commemorate her beloved wife Mumtaz Mahal, Taj Mahal is the benchmark monument of the Agra city. It is voted as one of the Seven Modern Wonders of the World. It took 22 years and 20000 workers to complete this awe-inspiring landmark which commemorates love of the Mughal Emperor Shah Jehan for his beloved wife. Standing on the bank of Yamuna and overlooking the Agra Red Fort, Taj mahal was built in memory of Mumtaj Mahal in 1637. Listed as a UNESCO World Heritage Site, Taj Mahal is the magnum opus of the fusion of Saracen, Islamic and Indian architecture.Centre of this monument is the tomb of Mumtaz Mahal. The tomb is flanked by the four minarets. The main chamber has the false sarcophagi of Mumtaj Mahal and Shah Jehan, whereas the original graves are in the basement of the tomb. The interiors of the tomb as well as the sarcophagi is exquisitely carved in Persian tradition of architecture and are a joy to behold. The interiors is also adorned with jewels and paintings which add to the remarkable architectural pattern. Taj Mahal is nestled admist the 300 meters of lush Mughal Garden. A marble water tank in the center of the garden offers a stunning reflection of the mausoleum. Taj Mahal attracts a number of tourists (2-4 millions) from around the world throughout the year. Located in Agra, Taj Mahal is well connected by road and rail. It is close to national capital Delhi. 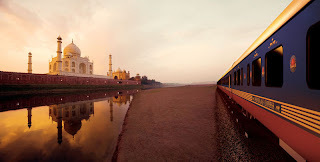 A visit to Taj Mahal is also included in the itineraries of various luxury trains in India. Both of the Rajasthan bound luxury trains the Palace on Wheels and the Royal Rajasthan on Wheels also take the guests on an unforgettable chug across famous destinations in Rajasthan along with a halt in Agra to visit the Taj Mahal.